44,8 x 31,1 cm - 17 5/8 x 12 3/16 in. Michel Manzi, Paris – Vente Manzi-Jiyant, Paris, 13-14 mars 1919, n° 127 – Collection particulière (Mancini ?) – Edouard Mollard, Paris – Enriqueta Alsop-Mollard (sa veuve) – Vente galerie Charpentier, Paris, 21 mars 1958, n° B – Paul Rosenberg & Co., New York, novembre 1959 (Stock n° 5731) – John D. Rockefeller, III, New York – [E. V. Thaw, New York, 22 août 1978] – Norton Simon Museum, Pasadena, 1978. The Art Institute of Chicago, 1978-1979, En prêt. Browse, , p. 361, pl. 67 – Browse, 1960, fig. 19 – Hüttinger, 1988, p. 88 (repr.) 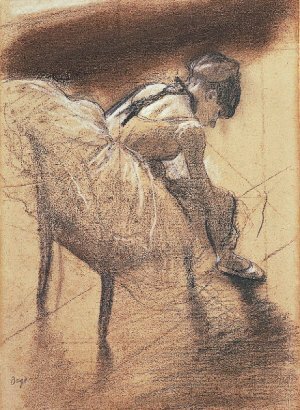 – Muchnic, 1998, p. 40, 233 - Degas in the Norton Simon Museum, 2009, II, n° 14, repr. p. 145.